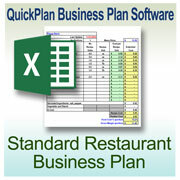 FoodSoftware.com specializes in software for restaurants and offers a variety of restaurant software products for Windows PCs. Products in our restaurant software category are software items which are often used, especially well-suited or specifically designed for restaurant operations. Though many of our software titles are restaurant industry standards, they are still very specialized and not found in any retail store. Restaurant "software" are of two main types: computer programs and "contentware". Computer programs are the familiar type that perform business functions such as reporting, computing and storing data. Contentware are computer files that deliver documents, databases, forms, graphics, ebooks and other data types. 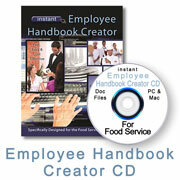 Customizable restaurant employee handbooks (as editable word processing files). 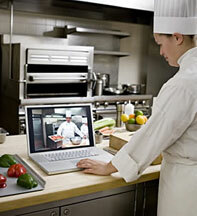 Customizable restaurant employee training manuals (as editable word processing files). Food yield databases (searchable tables of percentages of servable food after preparation of the raw). 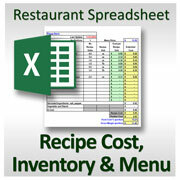 Restaurant accounting and management forms (assorted predesigned forms for printing on paper from PDF files). Collections of food images and graphic elements suitable for use with restaurant menus and advertising documents. Ebooks on various topics such as restaurant accounting, recipe costing and ethnic recipes. Food and beverage cost reporting, control and reduction. Menu item sales analysis for profit contribution (�menu engineering�). Food inventory purchasing � to meet stock requirements and production forecasts. Simplified do-it-yourself design and in-house printing of professional-looking restaurant menus to reduce design and printing expense and cut turnaround time for menu changes. 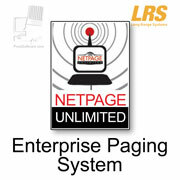 Output of menus as PDF files for emailing and posting on web sites. Employee Scheduling Software for automatic creation of employee schedules and labor cost control. USDA-compliant Nutrition Facts panel creation for retail product labeling. Compliance with laws governing availability of nutrition data to customers. Daily Accounting and Management Spreadsheets are simplified, pre-written spreadsheets for daily sales and cost writeup. 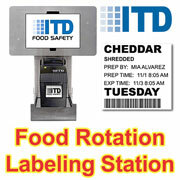 Food Rotation Labeling Software easily creates food batch identity and use-by date container labels to help prevent food spoilage. Hospitality Business Plan Software is for creating comprehensive presentations for procuring business startup loans. New Restaurant Startup Spreadsheets help you project the total cost of building, equipping and opening your new restaurant. Clip Art Collections of food products and graphic elements enhance your menu designs and promotional material. Reservations Software for taking reservations and tracking regular customers. 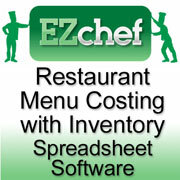 Restaurant Software Not Sold by FoodSoftware.com: Two major classes of software are absent from the FoodSoftware.com catalog: POS ("Point of Sale" or cash register) and general accounting. POS software and its associated hardware often requires intensive support that is usually best provided by local dealers. 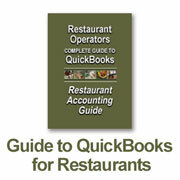 Most restaurants use Quickbooks for their general accounting software (general ledger, accounts payable, etc.) which does not need to be specialized for restaurants. Quickbooks is sold by all major office supply retailers. All restaurant software titles at FoodSoftware.com are meant to run on all versions of Windows from Windows XP to Windows 7. No titles have special hardware requirements or unusually large files that require large amounts of hard drive space (except those items that are sold specifically as software and hardware combinations). Most titles are self-contained �applications� that do not need other software in order to run. Some titles are spreadsheets that require Microsoft Excel to run. Some titles are text or Microsoft Word files that require Word-compatible software to run. Mac Users: FoodSoftware.com has very few titles that run on the native Mac OS. However, all recent Macs can be equipped with Windows, and with such, all of our Windows software will run on your Mac too. Some, but not most, of our spreadsheet titles run on the Mac version of Excel. All of our text and Word titles open in the Mac version of Microsoft Word. Most software titles here are "restaurant back office" applications that run on your restaurant office computer or personal laptop and are not usually installed on the same computers than run your POS (cash register) software. 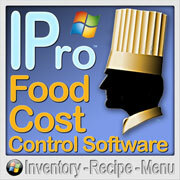 All FoodSoftware.com software products are installed on your own PCs and are not web-hosted applications. All of your data is stored only on your own PC and remains private. Software titles at FoodSoftware.com are for various computer skill levels from beginner to advanced. In particular, we have a variety of food inventory and costing programs that range from basic and easy to comprehensive and more involved. Our spreadsheet-based software titles are generally simpler than the non-spreadsheet software. There is always a tradeoff between simplicity and features, especially where food cost control software is concerned. The easier programs have fewer features and are not as effective at saving money as the comprehensive programs, but they are better than doing nothing. The comprehensive programs may be too difficult for some people to understand or use even though the payback from using them is enormous. It is extremely important to choose your priorities: Do you want easy and mildly effective or harder but very effective at saving money? Keep in mind that restaurants are a complicated and risky profession that requires professional skills and professional-level software to run profitably. For the maximum benefit from professional restaurant software, be prepared to spend the time and make the study effort it takes to be proficient at using the software. You will be rewarded for doing so. IPro Series 40 is our most popular restaurant comprehensive, full-featured inventory, recipe costing, purchasing and sales analysis software. Dramatically reduces food and beverage costs by detecting creeping costs, overuse, theft and unknown costs. Full actual (periodic) and ideal (perpetual) inventory for food, liquor and supplies. Build-to-par and forecast ordering and purchase and cost history. Recipe costing, resizing and printing. Stock depletion by sales or production. Sales and profit history, trends and analysis. Complete and flexible reports with unlimited history range. Compares to others programs at ten times the price! 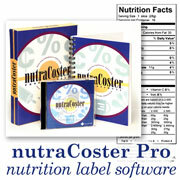 nutraCoster does recipe nutritional analysis to help comply with nutrition information laws and address customer questions and concerns. 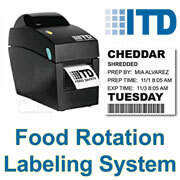 Creates USDA-complient Nutrition Facts panels for commercial food packaging. Also does recipe cost analysis. Support for most of our software products is free and unlimited for current versions. Installation policies (number of computers allowed) and multiuser capabilities and costs vary by product. Many software titles here may be installed on multiple computers without additional cost. Many titles are also multiuser in network environments. Some titles require additional costs per simultaneous additional user. Demonstration media availability, trial periods and refund policies vary by product. Please note that software items are not refundable unless specifically stated as otherwise, so please carefully determine the software's suitability for your purpose, skill level and computer type. Detailed information for making sound purchase decisions is available about all of our restaurant software products both at the FoodSoftware.com website and by phone if you call 805-375-7000 during Pacific business hours. 42 items found searching fields.